On Sale Now! Save 7% on the Fox Spartan 2 Leonida Bayonet Fixed Blade Knife,7.25in,Partially Serrated Blade,Black FX-0193001 by Fox at MZ Italia. MPN: FX-0193001. Hurry! Limited time offer. Offer valid only while supplies last. 12 1/4'' overall. 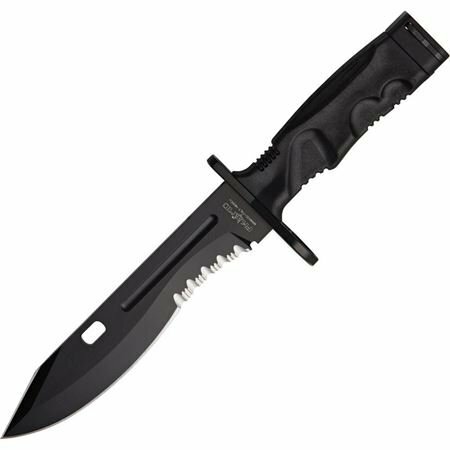 7 1/4'' black finish N690Co Cobalt Vanadium stainless partially serrated blade. Top of blade has 1 3/4'' sharpened section at the tip. 12 1/4" overall. 7 1/4" black finish N690Co Cobalt Vanadium stainless partially serrated blade. Top of blade has 1 3/4" sharpened section at the tip. Black Forprene handle. Black Forprene and nylon M.O.L.L.E. compatible belt sheath with stainless wire cutter and diamond sharpening plate. Cord lanyard.